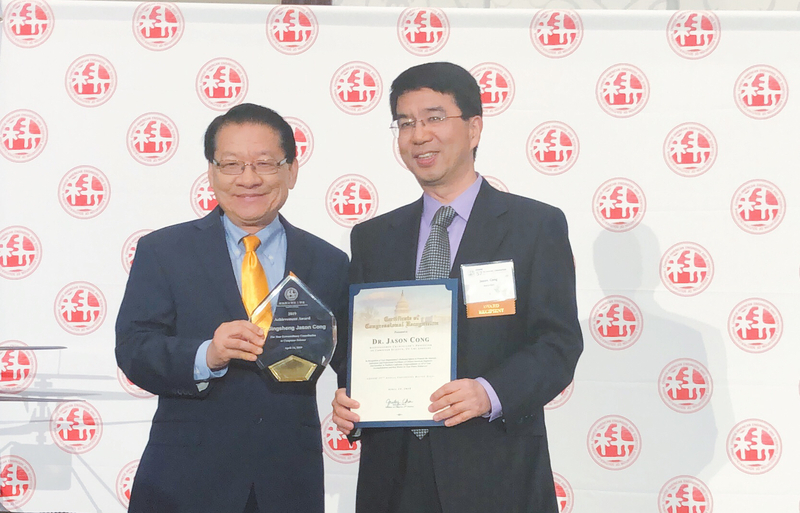 Prof. Jason Cong was one of three recipients of the 2019 CESASC Achievement Award, which was given on Sunday, April 14, 2019 at the 57th Annual Convention of Chinese-American Engineers and Scientists Association of Southern California (CESASC). The CESASC is a non-profit professional organization founded in 1962, with the mission to promote and advocate the best interests, aspirations, and professional excellence of Chinese-American engineers and scientists, and to provide career and educational enhancement opportunities, technical exchange, fellowship and community service. Past CESASC Achievement Award include Nobel Laureates, industry leaders, heads of institutions, and top policy makers, such as Dr. Steve Chu (朱棣文), Dr. Chen Ning Yang (楊振寧), Dr. Chen-Dau Lee (李政道), Yuan T. Lee (李遠哲), Dr. Samuel C. C. Ting (丁肇中), Dr. David Ho (何大一), Dr. Shu Chien (錢煦), Dr. Henry C. Lee (李昌鈺), Ms. Elaine L. Chao (趙小蘭), plus many more. More information about CESASC and the award is available at http://www.cesasc.org. Computer Science Professor Jason Cong and coauthors Yi-Hsiang Lai, Yuze Chi, Yuwei Hu, Jie Wang, Cody Hao Yu, Yuan Zhou, and Prof. Zhiru Zhang has received the Best Paper Award at the 27th ACM/SIGDA International Symposium on Field-Programmable Gate Arrays held in Seaside, CA, February 24-26, 2019. Their paper, "HeteroCL: A Multi-Paradigm Programming Infrastructure for Software-Defined Reconfigurable Computing” results from a close collaboration between Prof. Zhang’s group at Cornell and Prof. Cong’s group at UCLA. HeteroCL is a multi-paradigm programming infrastructure for heterogeneous platforms integrating CPUs and FPGAs. HeteroCL not only provides a clean abstraction that decouples the algorithm from compute/data customization, but it also captures the interdependence among them. Moreover, HeteroCL incorporates spatial architecture templates including systolic arrays and stencil with dataflow architectures. HeteroCL can help developers to focus more on designing efficient algorithms rather than being distracted by low-level implementation details. The ACM/SIGDA International Symposium on Field-Programmable Gate Arrays is the premier conference for presentation of advances in all areas related to the FPGA technology, including FPGA architecture, FPGA circuit design, CAD for FPGAs, high-level abstractions and tools for FPGAs, FPGA-based and FPGA-like computing engines, as well as applications and design studies. This year's Best Paper Award is selected from a total of 161 submissions. Congratulations to Deming Chen, a former member of Prof. Cong's lab, for being elected to IEEE fellow "for contributions to FPGA high-level synthesis." The IEEE is the world’s leading professional association for advancing technology for humanity. Through its 400,000 plus members in 160 countries, the association is a leading authority on a wide variety of areas ranging from aerospace systems, computers and telecommunications to biomedical engineering, electric power and consumer electronics. Recognizing the achievements of its members is an important part of the mission of the IEEE. Each year, following a rigorous evaluation procedure, the IEEE Fellow Committee recommends a select group of recipients for elevation to IEEE Fellow. Less than 0.1% of voting members are selected annually for this member grade elevation. Prof. Cong delivered a keynote speech at the 2018 Computing in the 21st Century Conference (21CCC) & Asia Faculty Summit hosted by Microsoft Research Asia (MSRA) in junction with the MSRA 20-Year Anniversary Celebration on November 6, 2018 held in Beijing, China. The title of Prof. Cong's speech is "Automating Customizable Computing – Democratizing Accelerator Designs at the Edge and in the Cloud." 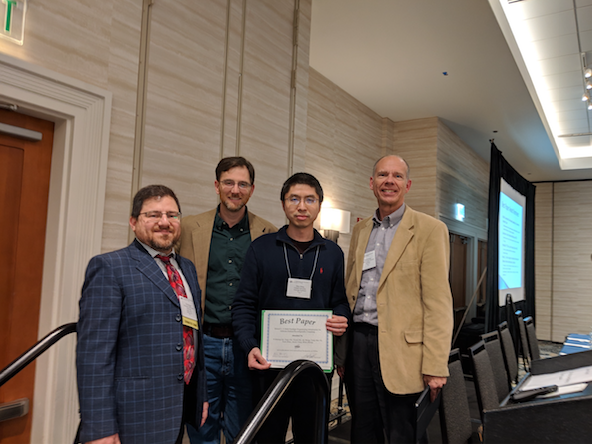 The paper is co-authored by Zhe Chen, Andrew Howe, Hugh T. Blair, and Jason Cong with the title "CLINK: Compact LSTM Inference Kernel for Energy Efficient Neurofeedback Devices.” received the Best Paper Award at the International Symposium on Low Power Electronics and Design (ISLPED’18) held in Seattle, WA, USA during July 23-25, 2018. Dr. Zhe Chen is a postdoctoral researcher jointly supervised by Prof. Jason Cong from the Computer Science Department and Prof. Tad Blair from the Psychology Department. This paper presents a highly energy-efficient electroencephalography (EEG) signal processing accelerator for neurofeedback devices using the long short-term memory (LSTM) based neural network model. It has potential applications for treating neurological diseases such as Parkinsonism and epilepsy using neurofeedback deep brain stimulation. We are pleased to announce that Professors Jason Cong (CS) and Song-Chun Zhu (CS and Statistics) are part of the University of Virginia’s new $27.5M Center on Research in Intelligent Storage and Processing in Memory (CRISP)—one of six Joint University Microelectronics Program (JUMP) centers nationwide that are managed by the Semiconductor Research Corporation with cost-sharing from DARPA. Each research center will examine a different challenge in advancing microelectronics—a field that is crucial to the U.S. economy and its national defense. The six JUMP centers are located at the University of Virginia, UC Santa Barbara, Carnegie Mellon, Purdue, University of Michigan and Notre Dame. UV’s CRISP Center will bring together researchers from eight universities in an effort to remove the separation between memories that store data and processors that operate on that data—a separation that has been part of all mainstream computing architectures since 1945 when von Neumann first outlined how programmable computers should be structured. Unfortunately, that technology led to today's “memory wall” in which data access has become a major performance bottleneck. Professors Cong and Zhu will work with CRISP researchers and become instrumental in removing that bottleneck. Prof. Cong delivered a distinguished lecture at the ECE Department of Northeastern University in Boston, MA on February 21, 2018. The title of Prof. Cong's speech is "Computing Near the End of Moore's Law". Zhiru received his PhD from UCLA in 2007 under the supervision of Prof. Jason Cong. Currently, he is an Assistant Professor in the School of Electrical and Computer Engineering at Cornell University. His research investigates new algorithms, methodologies, and tools to extend the frontiers of design automation for high-performance and energy-efficient computer systems. His research has been recognized with the UCLA Rising Professional Achievement Award (2018), a DARPA Young Faculty Award (2015), the IEEE CEDA Ernest S. Kuh Early Career Award (2015), an NSF CAREER Award (2015). Prior to joining Cornell, Zhiru co-founded AutoESL Design Technologies, Inc. with Prof. Jason Cong, Dr. Yiping Fan, and Dr. Jing Chang. AutoESL was acquired by Xilinx in 2011. Its high-level synthesis tool is now known as Vivado HLS, widely used in the industry. The Rising Professional Achievement Award honors the early career achievements of alumni who are under the age of 40, with impactful accomplishments in academia, industry or entrepreneurship; contributions to the engineering profession; a demonstrated commitment to mentorship; and notable service to the community and the profession. UCLA and Cornell Research Team Win Award from Intel and the National Science Foundation for Heterogeneous Computing Research Effort. Prof. Cong delivered a keynote speech at the 2017 China National Computer Congress (CNCC) on October 27, 2017 held in Fuzhou, China. The title of Prof. Cong's speech is "Computing Near the End of Moore’s Law". Prof. Cong is awarded "Distinguished Contribution Award" by the China Computer Federation (CCF) on CNCC. Congratulations to the new PhD, Dr. Di Wu under supervision of Prof. Jason Cong! His thesis title is "Scaling Acceleration-Rich Systems for Big-data Analytics". After graduation, he will continue with Falcon Computing Solutions, Inc. in Los Angeles, CA. Prof. Cong delivered a keynote speech at the 2017 IEEE International Symposium on Workload Characterization (IISWC'17) on October 2, 2017 held in Seattle, WA. 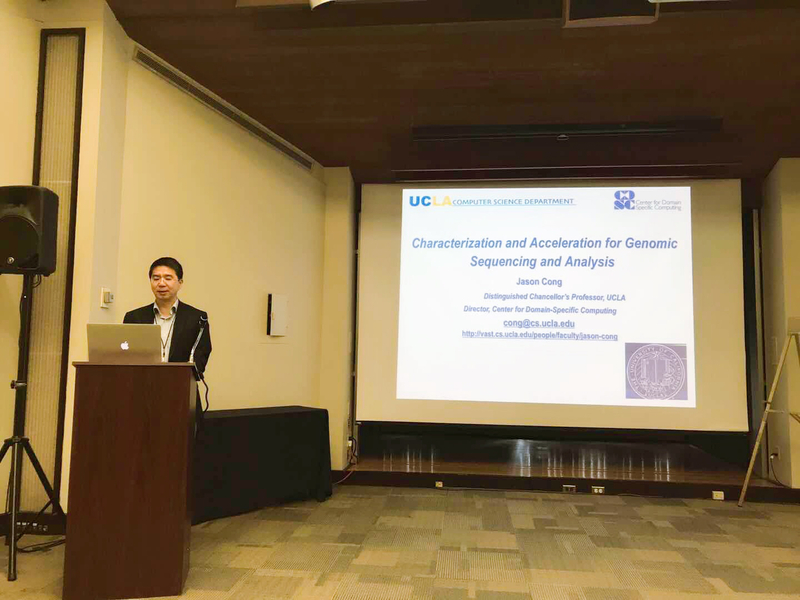 The title of Prof. Cong's speech is "Characterization and Acceleration for Genomic Sequencing and Analysis". 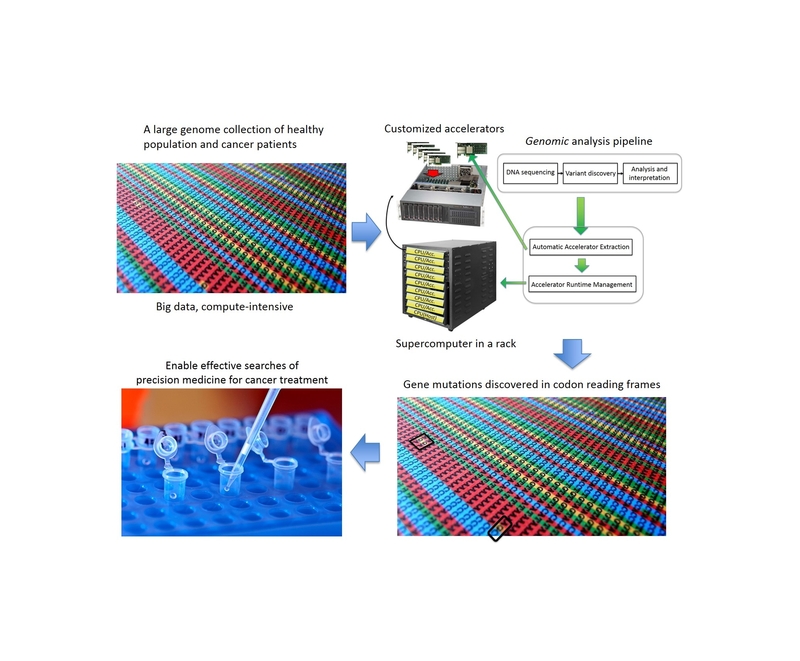 The talk covers background on genomic processing pipeline, workload characterization and optimization and acceleration developed in the group. Computational genomics plays an important role in health care, but is computationally challenging as most genomic applications use large data sets and are both computation-intensive and memory-intensive. Recent approaches with on-chip hardware accelerators can boost computing capability and energy efficiency, but are limited by the memory requirements of accelerators when processing workloads like computational genomics. In this paper we propose the accelerator-interposed memory (AIM) as a means of scalable and noninvasive near-memory acceleration. To avoid the high memory access latency and bandwidth limitation of CPU-side acceleration, we design accelerators as a separate package, called AIM module, and physically place an AIM module between each DRAM DIMM module and conventional memory bus network. Experimental results for genomic applications confirm the benefits of AIM. Due to the much lower memory access latency and scalable memory bandwidth, our non-invasive AIM achieves much better performance scalability than the CPU-side acceleration when the memory system scales up. This collaborative work involves a team of researchers from several areas of UCLA. Professor Jason Cong and Professor Tad Blair from UCLA’s Brain Research Institute are refining the wireless miniscope to give it built-in, energy-efficient computing capability for real-time feedback and analysis. Congratulations to the new PhD, Dr. Muhuan Huang under supervision of Prof. Jason Cong! Her thesis title is "Resource and Data Management in Accelerator-Rich Architectures". Muhuan graduated on December 2016 and joined Google, Inc. in Mountain View, CA after graduation. 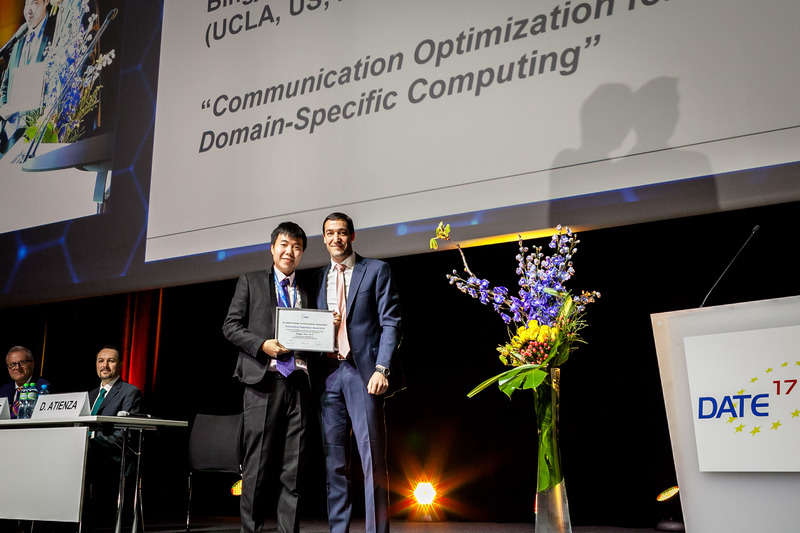 Congratulations to Bingjun Xiao (PhD’2015, advisor, Jason Cong), whose dissertation "Communication Optimization for Customizable Domain-Specific Computing", has been awarded the 2016 EDAA Outstanding PhD Dissertation Award. The award was presented at the conference DATE 2017 – Design, Automation & Test in Europe, on Mar 28 in Lausanne, Switzerland. EDAA is a non-profit association. Its purpose is to operate for educational, scientific and technical purposes for the benefit of the international electronics design and design automation community. The Association, in the field of design and design automation of electronic circuits and systems, promotes a series of high quality technical international conferences and workshops across Europe and cooperates actively to maintain harmonious relationships with other national and international technical societies and groups promoting the purpose of the Association. EDAA is the main sponsor of DATE, the premier Design, Automation and Test Conference and Exhibition in Europe. In celebrating the 25th anniversary of the FPGA Symposium, which took place February 22nd through 24th in Monterey, California, ACM/SIGDA TCFPGA initiated the FPGA and Reconfigurable Computing Hall of Fame program at the symposium. The paper entitled “FlowMap: An Optimal Technology Mapping Algorithm for Delay Optimization in Lookup-Table Based FPGA Designs” by Prof. Jason Cong and his former PhD student Dr. Eugene Ding published in IEEE Transactions on Computer-Aided Design of Integrated Circuits and Systems, 1994, was inducted to the inaugural class of the Hall of Fame (http://hof.tcfpga.org). The endorsement letter is available at http://hof.tcfpga.org/wp-content/uploads/2017/02/flowmap1994_class2017.pdf. About ACM FPGA: The ACM/SIGDA International Symposium on Field-Programmable Gate Arrays, held annually in Monterey, is the premiere forum for the presentation of advances in all areas of FPGA technology. http://www.isfpga.org/. Three faculty members of the UCLA Henry Samueli School of Engineering and Applied Science – Jason Cong and George Varghese of Computer Science, and Behzad Razavi of Electrical Engineering (pictured left to right above) – have been elected to the National Academy of Engineering, among the highest honors that can be accorded to an American engineer. The academy announced the 2017 class of 84 members and 22 foreign members on February 8. With the election of Cong, Varghese and Razavi, UCLA Engineering has 35 affiliated faculty members who are members of the National Academy of Engineering. Prof. Jason Cong and his former students Guojie Luo, Jie Wei, and Yan Zhang received received the 10-Year Retrospective Most Influential Paper Award at 2017 Asia and South-Pafacific Design Automation ASP-DAC'17 in Tokyo, Japan on Jan. 17, 2017 for their paper entitled "Thermal-Aware 3D IC Placement Via Transformation” published in ASP-DAC in 2007. Prof. Cong’s group also received another 10-Year Retrospective Most Influential Paper Award at ASP-DAC’2015 two years ago. ASP-DAC 2017 is the twenty-second annual international conference on VLSI design automation in Asia and South Pacific region, one of the most active regions of design and fabrication of silicon chips in the world. The conference aims at providing the Asian and South Pacific CAD/DA and Design community with opportunities of presenting recent advances and with forums for future directions in technologies related to Electronic Design Automation (EDA). ASP-DAC cultivates and promotes interactions and presentations of novel ideas among EDA researchers/developers and system/circuit/device-level designers. It is attended by scientists, engineers, researchers, and students who are interested in theoretical and practical aspects of VLSI design and design automation worldwide. Dr. Zhenman Fang, advised by Professor Cong, is selected as one of the four Institute for Digital Research and Education (IDRE) inaugural fellows. Dr. Fang is researching on how new computer architectures can impact DNA sequencing technology. Dr. Zhenman Fang presented the Blaze demo on Dec 6, 2016 at the C-FAR (Center for Future Architectures Research) annual review hosted at University of Michigan. The Blaze demo won the 3rd place out of 49 demos from 15 top universities. Congratulations to all Blaze team members: Muhuan Huang, Di Wu, Cody Yu, Zhenman Fang, Matteo Interlandi, Tyson Condie and Jason Cong. More information about the C-FAR is avaialble at https://www.futurearchs.org/. Prof. Cong delivered a keynote speech at the Symposium on Emerging Trends in Computing on Oct. 10, 2016 in Montreux, Switzerland. The title of Prof. Cong's speech is "Customizable Computing: Options and Opportunities”. The objective of this symposium is to gather about 100 experts from the computing domain, to hear presentations on cutting edge themes and to participate in panel discussions. Participation is by invitation only. Videos of the technical presentations and panels will be made available to students for educational purposes. The symposium is funded by the Swiss Government initiative nano-tera.ch to promote international scientific exchanges. More information about the conference is available at http://si.epfl.ch/symposium2016. 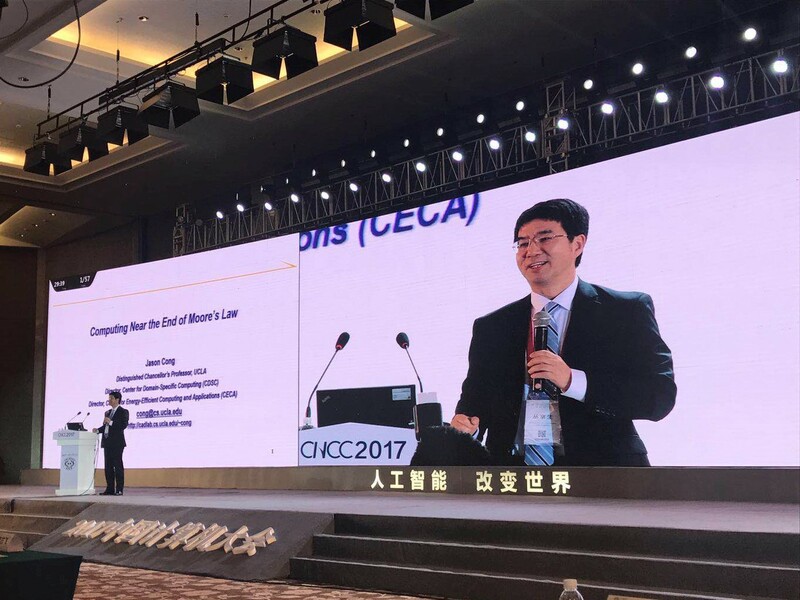 Prof. Jason Cong delivered a keynote speech at the The 11th Conference on Advanced Computer Architecture (ACA '2016) on August 23, 2016 held in Weihai, China. The title of Prof. Cong's speech is "“Customizable Computing — From Single-chip to Datacenters”. Prof. Jason Cong delivered the opening keynote speech at the The 11th IEEE International Conference on Networking, Architecture, and Storage (NAS 2016) on August 8, 2016 held at Long Beach, California. NAS provides a high-quality international forum to bring together researchers and practitioners from academia and industry to discuss cutting-edge research on networking, high-performance computer architecture, and parallel and distributed data storage technologies. The title of Prof. Cong’s speech is "Customizable Computing at Datacenter Scale”. More information about the conference is available at http://www.nas-conference.org/NAS-2016/index.html. Congratulations to new PhD, Dr. Yu-Ting Chen under supervision of Prof. Jason Cong! His thesis is "Memory System Optimizations for Customized Computing -- From Single-Chip to Datacenter". After graduation, he will join Google at Mountain View. Di Wu, advised by Professor Cong, is selected as 2016-2017 Dissertation Year Fellows by the UCLA Graduate Division. His thesis title is "Scaling Accelerator-Rich Systems for Big-Data Analytics". The fellowship program's intention is to support the final year of graduate school at the disertation writing stage and to facilitate the start of the teaching or research appointments soon after the end of the dissertation fellowship year. 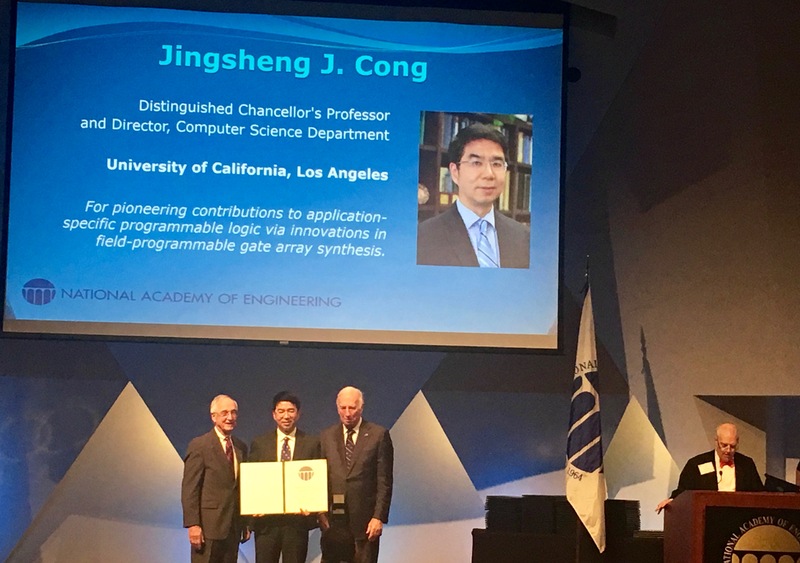 Dr. Jason Cong, a Chancellor’s Professor at the Computer Science Department, with joint appointment from Electrical Engineering Department of University of California, Los Angeles, has been selected to receive the 2016 Technical Achievement Award “For setting the algorithmic foundations for high-level synthesis of field programmable gate arrays”. Dr. Cong, elected to an IEEE Fellow in 2000 and ACM Fellow in 2008, is the recipient of the 2010 IEEE Circuits and System (CAS) Society Technical Achievement Award “For seminal contributions to electronic design automation, especially in FPGA synthesis, VLSI interconnect optimization, and physical design automation.” Dr. Cong is the only award recipient to receive the Technical Achievement Award from both the IEEE Computer Society and the IEEE CAS. 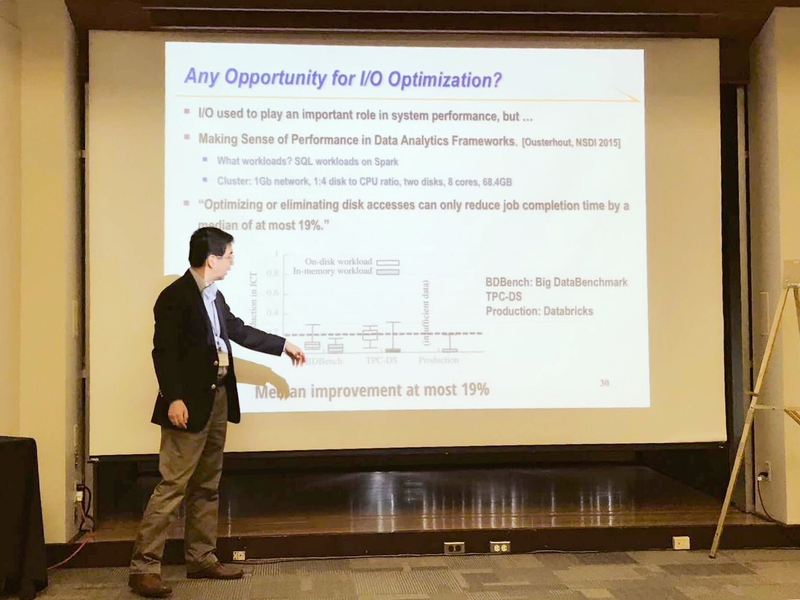 Prof Cong gave keynote speech "Datacenter-Scale Customizable Computing" at first International Workshop on Heterogeneous High-performance Reconfigurable Computing( H2RC'15) Held in conjunction with Super Computing 2015. Machine learning algorithms, such as those for image based search, face recognition, multi-category classification, and scene analysis, are being developed that will fundamentally alter the way individuals and organizations live, work, and interact with each other. However their computational complexity still challenges the state-of-the-art computing platforms, especially when the application of interest is tightly constrained by the requirements of low power, high throughput, small latency, etc. In recent years, there have been enormous advances in implementing machine learning algorithms with application-specific hardware (e.g., FPGA, ASIC, etc.). There is a timely need to map the latest learning algorithms to physical hardware, in order to achieve orders of magnitude improvement in performance, energy efficiency and compactness. Recent progress in computational neurosciences and nanoelectronic technology, such as resistive memory devices, will further help shed light on future hardware-software platforms for learning on-a-chip. The overarching goal of this workshop is to explore the potential of on-chip machine learning, to reveal emerging algorithms and design needs, and to promote novel applications for learning. It aims to establish a forum to discuss the current practices, as well as future research needs. 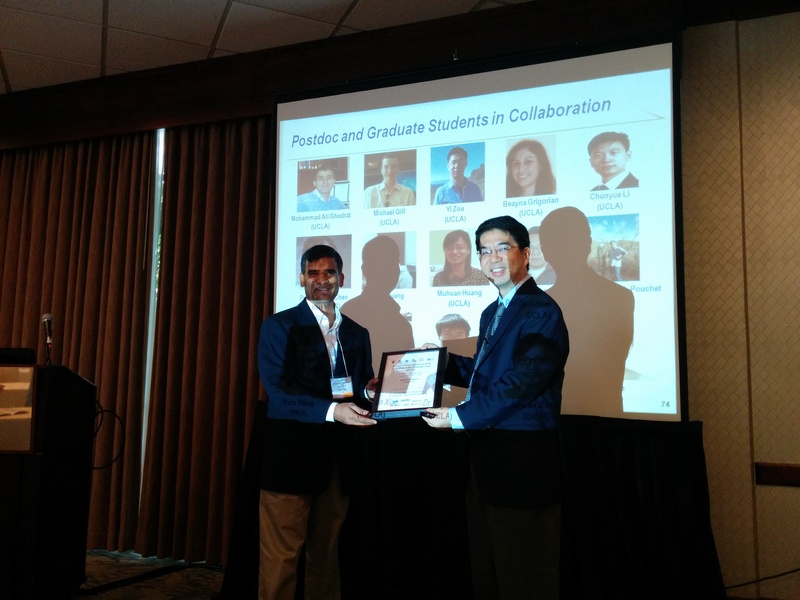 Alumni Prof. Deming Chen wins Best Paper Award at ICCAD'15, Austin, TX. ICCAD is the premier forum to explore emerging technology challenges, present cutting-edge R&D solutions, record theoretical and empirical advances, and identify future roadmaps for design automation. Continuing a long tradition, ICCAD continues to be the home for the ACM/SIGDA CADathlon and Student Research Competition, several CAD contests, including the IEEE CEDA CAD Contest, and a remarkable set of workshops on design automation for analog and mixed-signal circuits, EDA research on learning on a chip, design for dark silicon era, variability modeling and characterization, and formal verification. 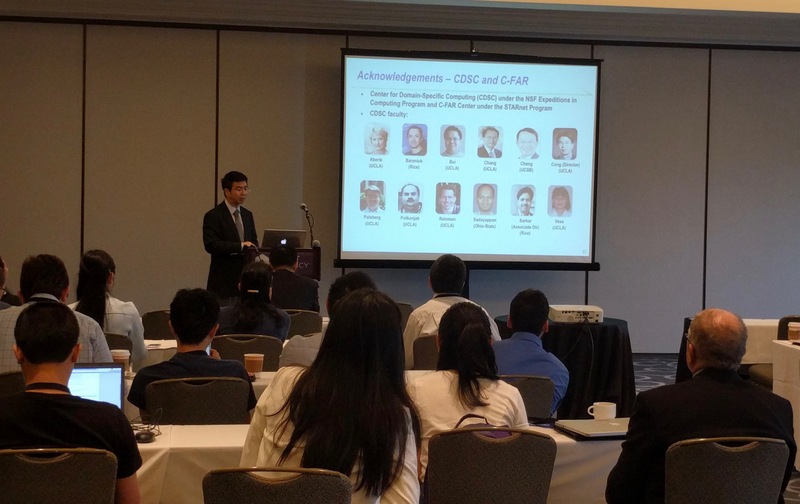 VAST Lab alumni Prof. Zhiru Zhang at Cornell University received the first IEEE CEDA Ernest S. Kuh Early Career Award on Nov. 2 at the opening session of ICCAD’2015. The IEEE CEDA Ernest S. Kuh Early Career Award honors an individual who has made innovative and substantial technical contributions to the area of Electronic Design Automation in the early stages of his or her career. Prof Jason Cong is one of the recipients of the Google Faculty Research Award for 2015. The one-year award supports the work of world-class, permanent faculty members at top universities around the world. with the aim of advancing cutting-edge research in computer science, engineering and related fields. At the conclusion of the “Customizable Domain-Specific Computing” project funded by the NSF Expeditions in Computing program in 2009, Prof. Cong, Prof. Reinman and their graduate students in the Center for Domain-Specific Computing (CDSC) published a book in the series of Synthesis Lectures on Computer Architecture by Morgan & Claypool Publishers. This book presents an overview and introduction of the recent developments on energy-efficient customizable architectures, including customizable cores and accelerators, on-chip memory customization, and interconnect optimization. In addition to a discussion of the general techniques and classification of different approaches used in each area, it also highlights and illustrates some of the most successful design examples in each category and discuss their impact on performance and energy efficiency. A large body of the research covered in the book were obtained during the course of the Expeditions in Computing project. Prof. Cong gave a keynote speech entitled as "High-Level Synthesis and Beyond -- from Datacenters to IoTs" at SOCC'15, the 28th IEEE International System-on-Chip Conference, Beijing, China on September 9, 2015. About SOCC'15: In its 27 years of history, the IEEE International System-on-Chip Conference (SOCC) has been the premier forum for sharing advances in system-on-chip (SoC) technologies, designs, tools, test, verification and applications. Held at changing locations in the USA, Europe and Asia, SOCC is attracting researchers and engineers from all over the world to exchange knowledge, share experiences and establish collaborations with colleagues. research paper by Jason Cong, a Chancellor’s Professor in UCLA’s Computer Science Department, and his former doctoral student, Yan Zhang, was selected as the 10-Year Retrospective Most Influential Paper in the 2015 Asia South-Pacific Design Automation Conference (ASPDAC). The award for the paper, “Thermal-Driven Multilevel Routing for 3-DICs,” was presented at the opening ceremony of ASPDAC’15 on Jan. 20, in Chiba/Tokyo, Japan. Cong, on faculty at the UCLA Henry Samueli School of Engineering and Applied Science, is the director of Center for Domain-Specific Computing, co-director of UCLA/Peking University Joint Research Institute in Science and Engineering and co-director of the VLSI CAD Laboratory. His research interests include synthesis of VLSI circuits and systems, programmable systems, novel computer architectures, nano-systems and highly scalable algorithms. He has over 350 publications in these areas and has won seven best paper awards and the 2011 ACM/IEEE A. Richard Newton Technical Impact Award in Electric Design Automation. He was elected to an IEEE Fellow in 2000 and ACM Fellow in 2008. He is the recipient of the 2010 IEEE Circuits and System Society Technical Achievement Award "for seminal contributions to electronic design automation, especially in FPGA synthesis, VLSI interconnect optimization, and physical design automation." Congratulations to Jason Cong and coauthors Jie Wei and Yan Zhang. Their 2004 paper, A Thermal-Driven Floorplanning Algorithm for 3D ICs, has received this year's ICCAD Ten-Year Retrospective Most Influential Paper Award. ICCAD (International Conference on Computer-Aided Design) judged this paper to be the "most influential on research and industrial practice in computer-aided design of integrated circuits over the ten years since its original appearance at ICCAD." Prof. Jason Cong is selected as a recipient of the Distinguished Alumni Achievement Award from the Department of Computer Science at the University of Illinois at Urbana-Champaign. The award is given on Oct. 24, 2014 during the CS @ ILLINOIS 50th Anniversary Celebration. Prof. Jason Cong is giving the keynote speech entitled "Design Automation Beyond High-Level Synthesis" at the 22nd IPIP/IEEE VLSI-SoC 2014 on Oct. 6, 2014. VLSI-SoC 2014 is the 22nd in a series of international conferences sponsored by IFIP TC 10 Working Group 10.5, IEEE CEDA and IEEE CASS, which explores the state-of-the-art in the areas that surround Very Large Scale Integration (VLSI) and System-on-Chip (SoC). Previous conferences have taken place in Edinburgh, Trondheim, Tokyo, Vancouver, Munich, Grenoble, Gramado, Lisbon, Montpellier, Darmstadt, Perth, Nice, Atlanta, Rhodes, Florianópolis, Madrid, Hong Kong, Santa Cruz and Istanbul. The purpose of VLSI-SoC is to provide a forum to exchange ideas and showcase research as well industrial results in EDA, design methodology, test, design, verification, devices, process, systems issues and application domains of VLSI and SoC. In 14th IEEE International Symposium on Low Power Electronics and Design (ISLPED) 2014, La Jolla, CA, Professor Cong gave a keynote speech entitled "Accelerator-Rich Architectures — From Single-chip to Datacenters". Congratulations to David Pan for the appointment "Engineering Foundation Professor” at UT Austin. Last year David got Earl N. and Margaret Brasfield Endowed Faculty Fellowship in Engineering. David Z. Pan received his Ph.D. degree (with honor) from the VAST Lab (formerly the VLSI CAD Lab) in Computer Science from University of California at Los Angeles (UCLA) in 2000. In 2003, He joined Department of Electrical and Computer Engineering, The University of Texas at Austin. In partnership with Intel Corporation, NSF announced the first InTrans award of $3 million to a team of researchers who are designing customizable, domain-specific computing technologies for use in healthcare. The work could lead to less exposure to dangerous radiation during x-rays by speeding up the computing side of medicine. It also could result in patient-specific cancer treatments.Led by the University of California, Los Angeles, the research team includes experts in computer science and engineering, electrical engineering and medicine from Rice University and Oregon Health and Science University. The team comes mainly from the Center of Domain-Specific Computing (CDSC), which was supported by an NSF Expeditions in Computing Award in 2009. In the project, the researchers looked beyond parallelization (the process of working on a problem with more than one processor at the same time) and instead focused on domain-specific customization, a disruptive technology with the potential to bring orders-of-magnitude improvements to important applications. 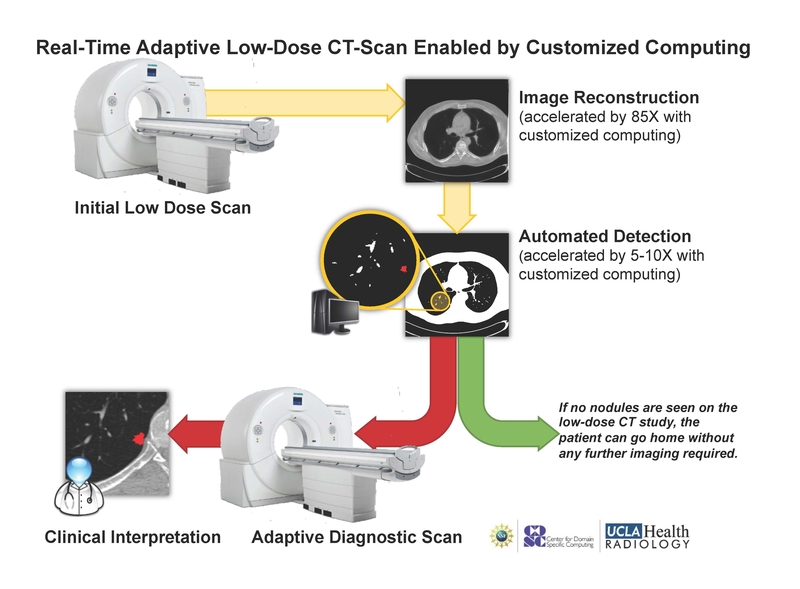 Domain-specific computing systems work efficiently on specific problems - in this case, medical imaging and DNA sequencing of tumors - or a set of problems with similar features, reducing the time to solution and bringing down costs.The InTrans program not only advances important fundamental research and integrates it into industry, it also benefits society by improving medical imaging technologies and cancer treatments, helping to extend lives. In the Xilinx Emerging Technology Symposium (ETS) on Feburary 13rd, 2014, the UCLA team led by Professor Jason Cong are invited to demo FPGA acceleration on a 3-D medical imaging pipeline and an end-to-end system level automation flow called CMOST (Customization, Mapping, Optimization, Scheduling and Transformation). Professor Jason Cong has been selected as the keynote speaker at the 31st IEEE International Conference on Computer Design (ICCD). Jason's speech, entitled "Computing Beyond Processors", was presented on October 8th, 2013. 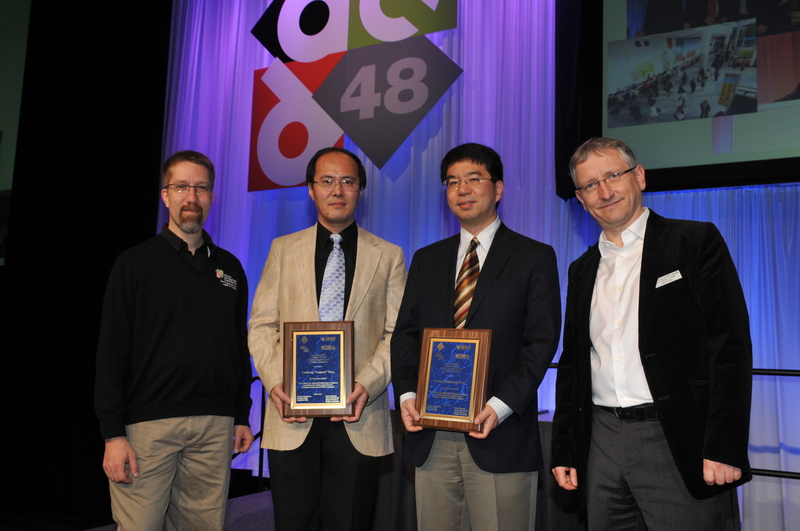 During the 50th DAC award banquet on June 5, 2013, Prof. Jason Cong received an DAC Prolific Author Award -- Club 40, which are given to authors with 40 or more papers in the 50-year history of the Design Automation Conference (DAC). Five other researchers in the Club 40 are Robert K. Brayton, Yao-Wen Chang, Kwang-Ting (Tim) Cheng, Andrew B. Kahng, and Martin D. F. Wong. Professor Jason Cong presented the keynote speech, Computing Beyond Processors, at the IEEE International Symposium on Circuits and Systems (ISCAS) held 19-23 May 2013 in Beijing, China. ISCAS is the world's premier networking forum for leading researchers in the highly active fields of theory, design, and implementation of circuits and systems. ISCAS 2013 is being attended by over 900 researchers worldwide. June, 2013: Best Paper Award in 2013 ACM Transactions on Design Automation of Electronic Systems (TODAES). Congratulations to Professor Jason Cong and his research group. The ACM Transactions on Design Automation of Electronic Systems (TODAES) has presented a Best Paper Award to Jason Cong, W. Jiang, B. Liu and Y. Zou for their paper Automatic Memory Partitioning and Scheduling for Throughput and Power Optimization, 16(2), April 2011. This is the third time that Professor Cong's research group has received a TODAES Best Paper Award. Other awards were received in 2005 and 2012. 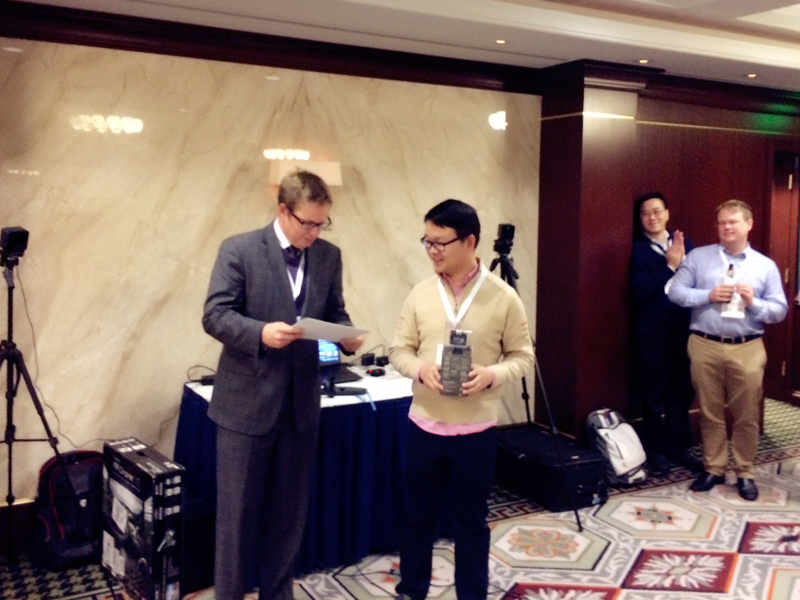 April, 2013 : Outstanding PhD Dissertation Award -- Guojie Luo . Congratulations to Dr. Guojie Luo who received the 2013 ACM SIGDA Outstanding PhD Dissertation Award in electronic design automation. His thesis is on "Placement and Design Planning for 3D Intergrated Circuits". The award will be presented at the Design Automation Conference (DAC) on June 4th in Austin, TX. December, 2012 : New Ph.D. -- Bin Liu . Congratulations to Dr. Bin Liu who received his Ph.D. degree in December 2012 under the supervision of Prof. Jason Cong. His thesis is on "High-Level Synthesis for Nanoscale Integrated Circuits". September, 2012 : New Ph.D. -- Chunyue Liu . Congratulations to Dr. Chunyue Liu who received his Ph.D. degree in September 2012 under the supervision of Prof. Jason Cong. His thesis is on "Architecture Support for Customized Domain-Specific Computing". After graduation, Dr. Liu has joined Google at Kirkland, WA. June, 2012 : New Ph.D. -- Yi Zou. Congratulations to Dr. Yi Zou who received his Ph.D. degree in June 2012 under the supervision of Prof. Jason Cong. His thesis is on "Coprocessor Acceleration for Domain-Specific Computing". June, 2012 : Best Paper Award in 2012 ACM Transactions on Design Automation of Electronic Systems (TODAES). Professor Jason Cong is a recipient of the 2012 ACM Transactions on Design Automation of Electronic Systems (TODAES) Best Paper Award for the journal entitled "Behavior-Level observability Analysis for Operation Gating in Low-Power Behavioral Synthesis," with co-authors from UCLA Bin Liu and Rupak Majumdar, and Zhiru Zhang from AutoESL Design Technologies, Inc. The award was presented on June 5, 2012 at the Design Automation Conference held in San Francisco, CA. March, 2012 : Professor Cong: Keynote Speaker at SASIMI 2012. Professor Cong served as the keynote speaker at The 17th Workshop on Synthesis And System Integration of Mixed Information technologies (SASIMI 2012) which was held on March 8, 2012 at Oita, Japan. Prof. Cong's talk was titled "Parallelization, Customization and Automation”. Nov, 2011 : Professor Cong: Award presenter at the 2011 Phil Kaufman Award Banquet. Professor Cong gave the presentation at the Phid Kaufman Award dinner in honor of Professor C. L. David Liu, recipient of the 18th Phil Kaufman Award by EDAC and CEDA, for his distinguished contributions to Electronic Design Automation (EDA). Professor Liu is a distinguished engineer and educator, and an astute business leader. The Phil Kaufman Award honors individuals who have had demonstrable impact on the field of electronic design through contributions in EDA. The video of Prof. Cong's presentation is available here (starting from slides 18). Sep, 2011 : Professor Cong served as keynote speaker at the 22nd IEEE International Conference on Application-Specific Systems, Architectures and Processors (ASAP 2011). Professor Cong gave the keynote speech "Era of Customization and Specialization" at the 22nd IEEE International Conference on Application-Specific Systems, Architectures and Processors (ASAP 2011). The conference was held in Santa Monica, CA, 11-14 September 2011. 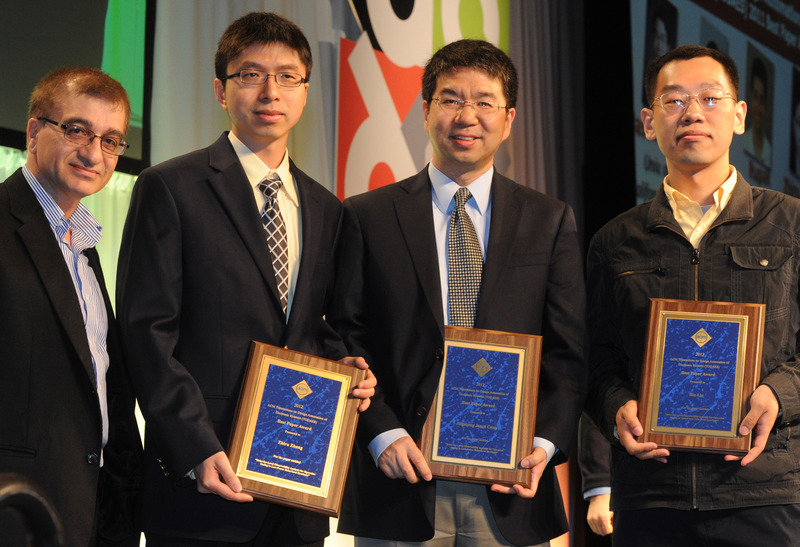 June, 2011 : Professor Cong and Dr. Eugene Ding receive ACM/IEEE A. Richard Newton Technical Impact Award in Electronic Design Automation 2011 . 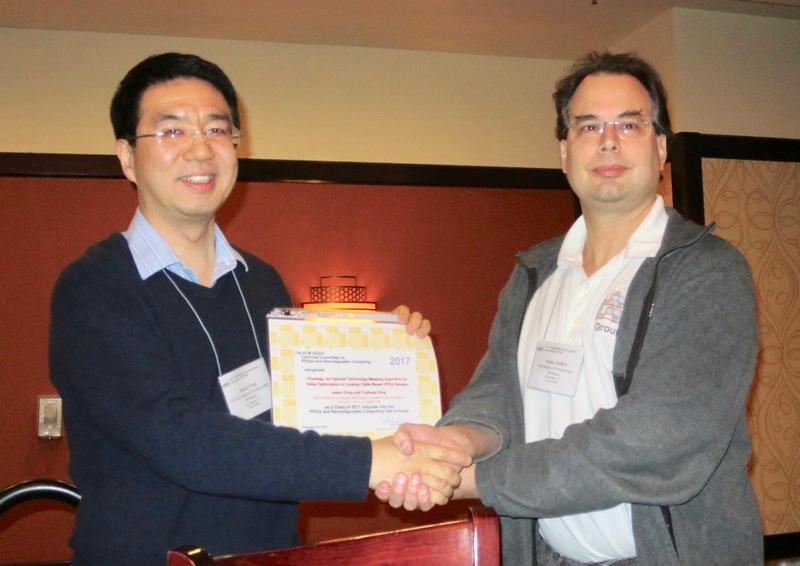 May, 2011 : Best Paper Award in the 19th Annual IEEE Symposium on Field-Programmable Custom Computing Machines (FCCM 2011). A team from UCLA and UIUC has won a Best Paper Award for the collaborative Multilevel Granularity Parallelism Synthesis on FPGAs. The paper, authored by A. Papakonstantinou, Y. Liang, J. Stratton, K. Gururaj, D. Chen, W. M. Hwu, and J. Cong, was selected out of 120 submissions to the 2011 IEEE International Symposium on Field-Programmable Custom Computing Machines. This work (code-named FCUDA-II) offers an advanced modeling and search engine in the multi-granularity parallelism design space to map CUDA kernels to FPGAs. It offers up to 7x speedup in terms of performance compared to the original FCUDA work (which received the Best Paper Award at SASP 2009). 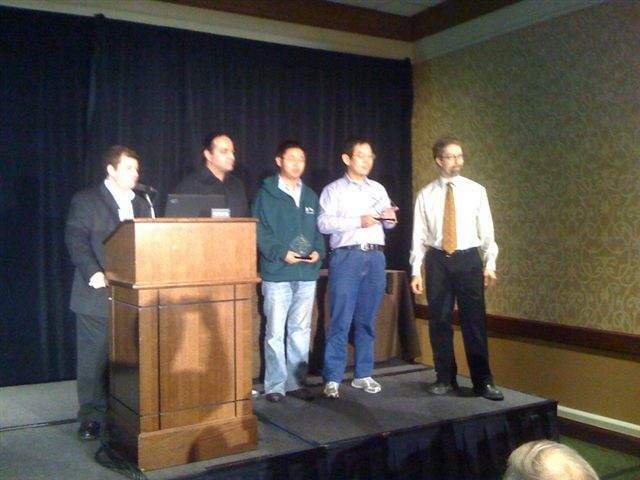 April, 2011 : UCLA-led team with Guojie Luo, Bingjun Xiao and Jason Cong (advisor) won the Second Prize in the routability-driven placement contest@ISPD 2011. February, 2011 : Engineering entrepreneurs: Taking university research to the public. November, 2010 : Bin Liu and Yi Zou won the First Prize of CADathlon@ICCAD. July, 2010 : Professor Jason Cong is the recipient of the 2010 IEEE Circuits and System (CAS) Society Technical Achievement Award. Congratulations to Dr. Kirill Minkovich who received his Ph.D. degree in April 2010 under the supervision of Prof. Jason Cong. His thesis is on "Logic Synthesis for Nanometer IC Technologies". After graduation, Kirill will work at HRL Laboratories as a postdoc. Congratulations to Dr. Wei jiang who received his Ph.D. degree in November 2009 under the supervision of Prof. Jason Cong. His thesis is on "Program Analysis and Transformation for ESL Synthesis". After graduation, Wei will join Google Inc. at Santa Monica. January, 2009 : Professor Jason Cong named ACM fellow "For contributions to Electronic Design Automation"
"These men and women are the inventors of technology that impact the way people live and work throughout the world," said ACM President, Professor Dame Wendy Hall. "Their selection as 2008 ACM Fellows offers us an opportunity to recognize their dedicated leadership in this dynamic field, and to honor their contributions to solving complex problems, expanding the impact of technology, and advancing the quality of life for people everywhere." A joint CS/EE paper authored by Frank Chang, Jason Cong, Adam Kaplan, Mishali Naik, Glenn Reinman, Eran Socher, and Rocco Tam has received the best paper award from the 14th International Symposium on High Performance Computer Architecture (HPCA) held February 16-20, 2008. This year's symposium received 161 papers, accepted 31, and gave only one best paper award. 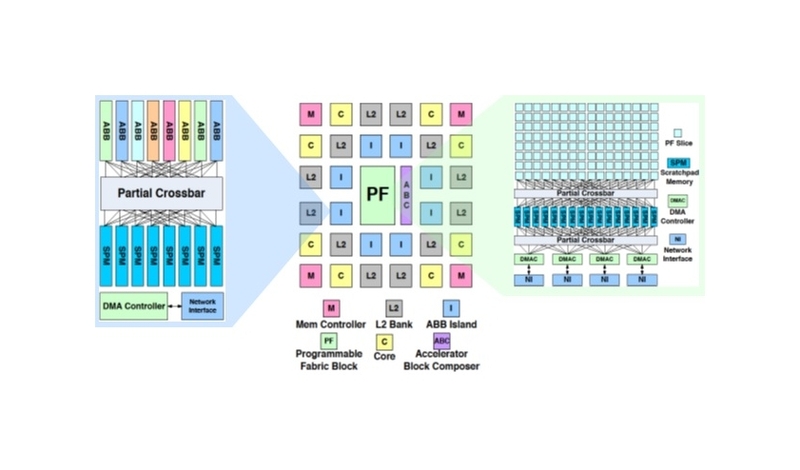 This paper, "CMP Network-on-Chip Overlaid With Multi-Band RF-Interconnect," explores the use of multi-band RF interconnect with signal propagation at the speed of light to provide shortcuts in a many-core network-on-chip (NOC) mesh topology. Congratulations to Dr. Guoling Han who received his Ph.D. degree in January 2008 under the supervision of Prof. Jason Cong. His thesis is on "Synthesis Techniques for Application-Specific Processor-Based Design". After graduation, Guoling will join AutoESL Design Technologies in Los Angeles. SCDsource mentioned Jason Cong and CADLab in their article entitled, "Multi-band RF interconnect speeds network-on-chip"
UCLA Newsroom mentioned Jason Cong and CADLab in their article entitled, "UCLA scientists working to create smaller, faster integrated circuits"
SolidState Technology mentioned Jason Cong and CADLab in their article entitled, "Moore's Law to head z-ward?" Congratulations to Dr. Zhiru Zhang for receiving the Outstanding Ph.D. Award from the UCLA Computer Science Department for the academic year 2006-2007. The CS department designates one Ph.D. and one MS recipient as the outstanding Ph.D. and MS student for our department for the year. The award will be formally announced in June 2007 at the Commencement of the UCLA School of Engineering and Applied Sciences. Congratulations to Dr. Zhiru Zhang who received his Ph.D. degree in March 2007 under the supervision of Prof. Jason Cong. His thesis is on "Behavior-Level Scheduling and Planning for Nanometer IC Designs". After graduation, Zhiru will join AutoESL Design Technologies in Los Angeles. Congratulations to Dr. Min Xie who received his Ph.D. degree in September 2006 under the supervision of Prof. Jason Cong. His thesis is on "Constraint-Driven Large-scale Circuit Placement Algorithms". After his graduation, Min will join KBC Financial Products USA Inc., New York. Congratulations to Dr. Yan Zhang who received her Ph.D. degree in September 2006 under the supervision of Prof. Jason Cong. Her thesis is on "Multilevel Routing for Higher Degree of Circuit Integration". After her graduation, Yan will join Magma Design Automation Inc., Los Angeles. Congratulations to Dr. Kenton N. K. Sze who received his Ph.D. degree in June 2006 under the supervision of Prof. Tony Chan and Prof. Jason Cong. His thesis is on "Multilevel Optimization for VLSI Circuit Placement". After his graduation, Kenton will join Magma Design Automation Inc., San Jose. The recent published paper "Optimality study of logic synthesis for LUT-based FPGAs" by Jason Cong, Kirill Minkovich (FPGA 2006) was the subject of an article that appeared on the EE times magazine in its online edition for the 20th of February. Zhiru Zhang received the 2005-2006 Phi Tau Phi Scholarship Award which is given each year by the West America Chapter of the Phi Tau Phi Scholastic Honor Society to four undergraduate or graduate students in the southern California in recognition of their academic achievements and scholarly contributions. The award consists of a certificate and a cash prize of $1,000. Zhiru is the first person in Prof. Cong's group who has received this award since its establishment in 1995. Congratulations to Prof. Jason Cong, Dr. Xin Yuan, and Hui Huang for receiving the 2005 Best Paper Award of the ACM Transactions on Design Automation of Electronic Systems (TODAES) of the following paper. 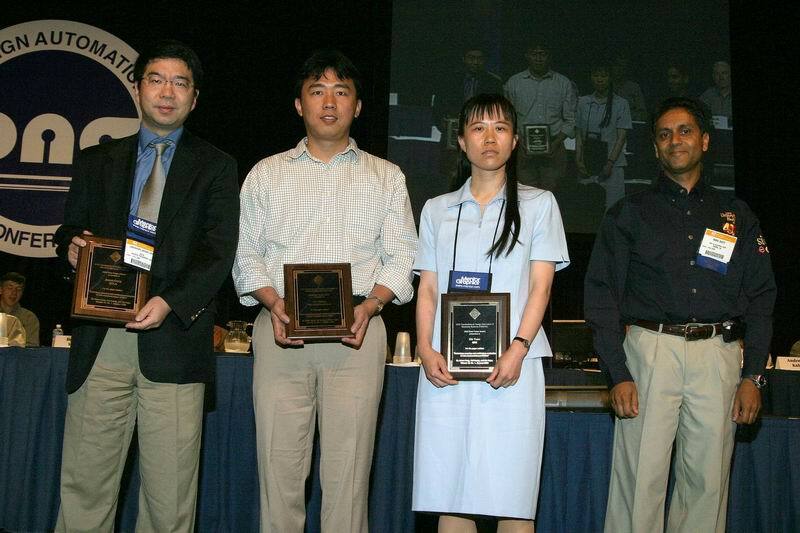 TODAES selects one paper each year for the best paper award, and this award was presented at the openning session at the opening session of the 2005 Design Automation Conference (DAC'2005) on June 14, 2005. [photo] J. Cong, H. Huang, and X. Yuan, "Technology Mapping and Architecture Evaluation for k/m-Macrocell-based FPGAs," ACM Transactions on Design Automation of Electronic Systems (TODAES), Vol. 10, pp. 3 - 23, January 2005 The paper presents a novel FPGA architecture based on k/m-macrocells, with in-depth quantitative architecture design and evaluation against widely used LUT-based FPGAs. It also presents efficient mapping algorithms for such architectures. The paper by T.Chan, J. Cong, and K. Sze entitled "Multilevel Generalized Force-directed Method for Circuit Placement" received the Best Paper Award at the 2005 International Symposium on Physical Design (ISPD'2005), held during April 4-6, 2005 in San Francisco, CA. ISPD is sponsored by ACM/SIGDA and with technical cosponsorship from IEEE Circuits and Systems Society, and is the premier forum for exchanging research results and ideas on VLSI physical design automation . 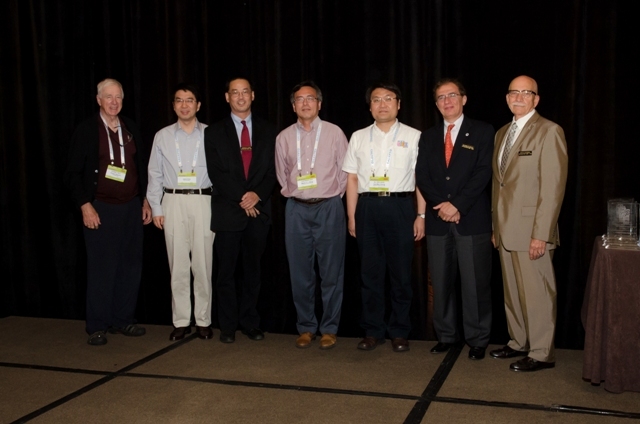 Each year, ISPD selects a single paper for the best paper award. The technical program of ISPD'2005 is available at www.ispd.cc. Congratulations to Dr. Michail Romesis who received his Ph.D. degree in March 2005 under the supervision of Prof. Jason Cong. His thesis is on "Automatic Design Planning and Exploration for VLSI Systems". After his graduation, Michail will join Magma Design Automation in the Netherlands. The recently published paper "Fast Floorplanning by Look-Ahead Enabled Recursive Bipartitioning" by Jason Cong, Michail Romesis and Joseph Shinnerl (ASPDAC 2005) was the subject of an article that appeared on the EE times magazine in its online edition for the 31st of January. Congratulations to Dr. Gang Chen who received his Ph.D. degree in Dec 2004 under the supervision of Prof. Jason Cong. His thesis is on "Unified Synthesis Techniques for High Performance FPGA Designs". Since 2003, Michael works for Magma Design Automation in Los Angeles, California. Congratulations to Ashok Jagannathan who received the highly competitive and prestigious Intel Fellowship. This competitive fellowship program awards 1-year fellowships to PhD candidates doing work in fields related to Intel's business and research interests. Fellowships are available at selected U.S. universities. Approximately 35 fellowships are awarded annually. Congratulations to Dr. Xin Yuan who received her Ph.D. degree in Aug 2003 under the supervision of Prof. Jason Cong. Her thesis is on "Multi-level Coarse Placement for Physical Hierarchy Generation". After her graduation, Xin joined IBM EDA in Burlington Vermont. Michail Romesis received the 2003 Dimitris Chorafas Foundation Award which is given each year to three graduate students in the UCLA School of Engineering and Applied Sciences for their outstanding research and academic performance. The award consists of a certificate and a cash prize of $4,000. Michail is the fifth person in Prof. Cong's group who has received this award since its establishment in 1995. The four previous winners from this group were Cheng-Kok Koh (1996), Lei He (1997), Songjie Xu (1999) and David Pan (2000). The poster from the SOC group (Yiping Fan, Guoling Han, Xun Yang, Zhiru Zhang) with the title "Architecture and Synthesis for Multi-Cycle Communication" won the best individual poster award at the annual UCLA Computer Science Research Review. This year's research review featured more than 70 posters from all the research groups of the Computer Science Department. The recently published paper "Optimality, Scalability and Stability Study of Partitioning and Placement Algorithms" by Jason Cong, Michail Romesis and Min Xie (ISPD 2003) was the subject of an article that appeared on the EE times magazine in its online edition for the 10th of April. The recently published paper "Optimality and Scalability Study of Existing Placement Algorithms" by Chin-Chih Chang, Jason Cong, and Min Xie (ASPDAC 2003) was the subject of an article that appeared in the cover of the EE times magazine in its online edition for the 5th of February. Congratulations to Tim Kong for receiving the Outstanding Ph.D. Award from the UCLA Computer Science Department for the academic year 2001-2002. Hidetoshi Matsuoka joined the research group of Prof. Jason Cong as visiting researcher from Fujitsu Laboratories. He will be with UCLA for a year. Matsuoka received his M.S. degree in electronic engineering in 1989. His research interest is multilayer area routing. Min Xie joined the research group of Prof. Jason Cong in September 2001. Min received his M.S. degree from Tsinghua University, China. Currently he works on multilayer gridless area routing. 2001. Zhiru received his B.S. degree from Peking University, China. His current research emphasis is on system-on-a-chip(SoC). 2001. Yiping received his M.S. degree from Tsinghua University, China. Currently he works on SOC. Sept, 2001: Prof. Jason Cong received the SRC Technical Excellence Award Recipient for Year 2000. "It is a great pleasure to inform you that Professor Jason Cong has been selected to be the SRC Technical Excellence recipient for the year 2000. Dr. Cong's work in the area of Interconnect Estimation, Planning and Synthesis for Sub-Micron Designs has significantly enhanced the productivity of the U.S. semiconductor industry. Dr. Cong will receive $5,000 in recognition of his achievements. The SRC Technical Excellence Award is given annually to researchers who, over a period of years, have demonstrated creative, consistent contributions to the field of semiconductor research, who are ground breakers and leaders in their fields, and who are regarded as model collaborators with their colleagues in the SRC member community. The SRC operates globally to provide a competitive advantage to its member companies as the world's premier research management consortium delivering relevantly educated technical talent and early research results. The SRC plans and manages a program of basic and applied university research on behalf of its participating members. We are very proud of the contributions made by Jason and his students and wish them continued success." Jason Cong's research group was awarded another contract from Semiconductor Research Corporation (SRC) on "Synthesis and Optimization under Physical Hierarchy". The specific tasks in this project include physical hierarchy generation, behavioral-level and logic-level synthesis under physical hierarchy and applications to synthesis with timing closure, micro-architecture evaluation and incremental system designs. During this year's Design Automation Conference in Las Vegas Jason Cong's group and alumni held a reunion meeting. Seven people from UCLA attended the meeting and six former students/visitors. This is intended to be an annual event occurring at every DAC. Alumni interested in attending the event should contact us at michail@cs.ucla.edu with his/her latest contact information. 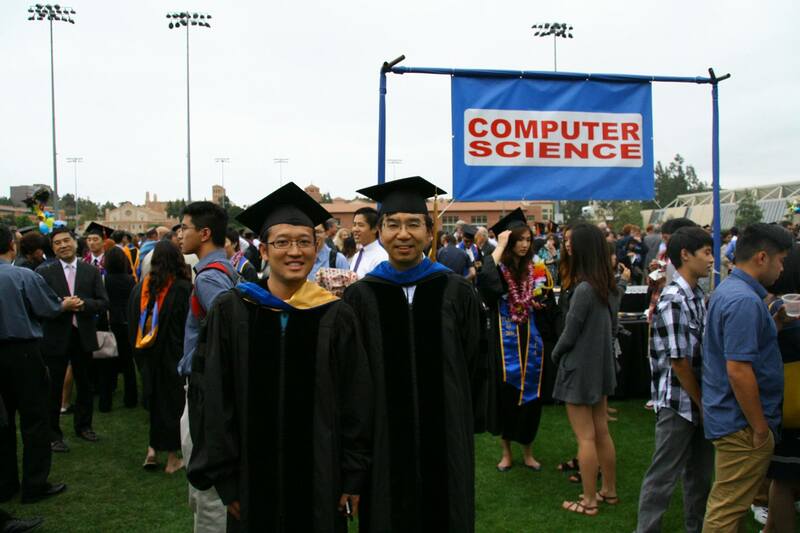 Congratulations to Songjie Xu and David Pan for receiving the Outstanding Ph.D. Award from the UCLA Computer Science Department for the academic year 2000-2001. The awards were formally announced on June 16, 2001 at the Commencement of the UCLA School of Engineering and Applied Sciences. 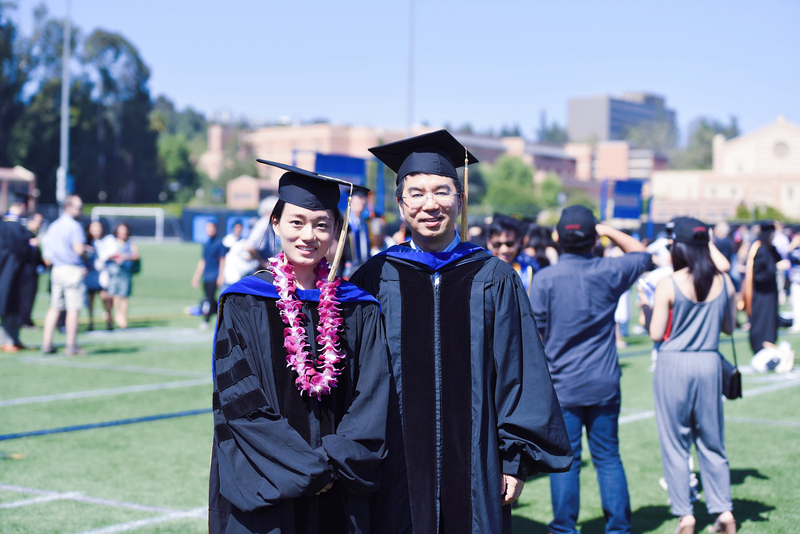 Dr. Wangning Long has completed his post-doctoral research at UCLA with Prof. Jason Cong. His research at UCLA was on SPFD and its application to rewiring. In June 2001, he presented his work on "Theory and Algorithm for Global SPFD-Based Rewiring" at the 2001 International Workshop of Logic Synthesis . He is now with the Aplus Design Technologies, Inc. as a Senior Engineer. Dr. Xun Yang joined the research group of Prof. Jason Cong as a post-doctoral researcher. Xun received his Ph.D. degree from the Beijing Institute of Technology in computer science. He also worked at Tsinghua University as a post-doctoral researcher from March 1999 to April 2001. His current interests include hardware/software co-design and co-verification. Dr. Zhong Chen joined the research group of Prof. Jason Cong as a visiting scholar. Dr. Chen is a Professor at the department of computer science and technology at Beijing University, China since 1995. He received his Ph.D. from the Beijing University in computer science. His research interests include security information based on system-on-a-chip, software-hardware co-design and embedded system technology. The proposal to NSF on Giga-Scale System-On-A-Chip Designhas been funded. This award will support the establishment of an International Research Center on System-On-A-Chip involving 7 universities in US (UCLA and UCSB), Taiwan (National Tsinghua Univ. and National Chiao Tung Univ. ), and China (Peking Univ., Tsinghua Univ., and Zhejiang Univ). There will also be supports from NSC (National Science Council) in Taiwan and CNSF (Chinese National Science Foundation) in China, to be announced later this year. The research activities of the center include investigation and development of efficient SOC synthesis tools, methodologies, SOC verification, test and diagnostic technologies, and an SOC design driver that motivates and validates various synthesis, verification and test techniques developed during the course of this research project. Jie Fang received his Ph.D. in February 2001 under Prof. Jason Cong. His thesis was on "Multi-Layer Gridless Detailed Routing". Jie is now a Design Engineer with Broadcom. Dr. Taku Uchino has completed his term as a visiting researcher at UCLA and returned back to Toshiba. His research in Prof. Jason Congss group was on power modeling for interconnect planning in deep submicron designs. A major part of his research result will appear in a paper entitiled "An Interconnect Energy Model Considering Coupling Effects" at the 2001 Design Automation Conference. Congratulations to Prof. Jason Cong, who was elected to an Fellow of IEEE (The Institute of Electrical and Electronics Engineers), a leading technical professional association of more than 350,000 individual members in 150 countries, in technical areas ranging from computer engineering, biomedical technology and telecommunications, to electric power, aerospace and consumer electronics, among others. In a letter issued by Dr. Bruce A. Eisenstein, the President of IEEE, it states that "Each year, following a rigorous evaluation procedure, the IEEE Fellow Committee recommends a select group of recipients for one of the Institute's most prestigious honors, election to IEEE Fellow." Dr. Jason Cong was elected to an IEEE Fellow at the meeting of the IEEE Board of Directors on December 3, 2000 with the following citation: "For contributions to the computer-aided design of integrated circuits, especially in physical design automation, interconnect optimization, and synthesis of field-programmable gate-arrays." Congratulations to Mr. David (Zhigang) Pan who received his Ph.D. degree in November 2000 under the supervision of Prof. Jason Cong. His thesis is on "Interconnect synthesis and planning for high-performance IC designs". He is now with the IBM T. J. Watson Research Center at Yorktown Heights, New York, where he is a Research Staff Member. Congratulations to Ms. Songjie Xu who received her Ph.D. degree in September 2000 under the supervision of Prof. Jason Cong. Her thesis is on "Synthesis for High-Density and High-Performance SRAM-Based FPGAs". She is now with the Aplus Design Technologies, Inc. in Los Angeles, California, where she is a founding member of the R&D team and Senior Engineer. Ashok Jagannathan joined the research group of Prof. Jason Cong in September 2000. Ashok received his M.S. degree in Electrical Engineering and Computer Science from the University of Illinois, Chicago. The title of his thesis was "Applications of Shortest Path Algorithm to VLSI Layout Problems". His current research area is on interconnect optimization. Yan Zhang joined the research group of Prof. Jason Cong in September 2000. Yan received her M.S. degree from Tsinghua University, China. Currently she works on multilayer general area gridless routing. Yizhou Lin joined the research group of Prof. Jason Cong in September 2000. Yizhou received a B.S. degree from Tsinghua University, China. His current research emphasis is on logic synthesis and optimization. Deming Chen joined the research group of Prof. Jason Cong in August 2000. Deming received his BS degree from the University of Pittsburgh. His current research area in on synthesis for programmable logics. "VLSI CAD in the 21st Century" is a celebraton of Prof. Cong and VLSI CAD Lab's 10th anniversary at UCLA. It also serves as the first reunion for all current and former members of Prof. Cong's research group. The highlight of this workshop includes the keynote speech by Prof. C.L. Liu (Prof. Cong's Ph.D. advisor, who is now President of National Tsing-Hua University in Taiwan) and the presentations from Prof. Cong's former Ph.D. students, who are now faculty members of major research universities, researcher of leading industrial research lab, and senior engineers of CAD companies. In addition, we will have a lot of fun events. Please browse the following program and if you have any suggestion, please let us know. Partitioning". Sung came to UCLA VLSI CAD Laboratory in Fall 1995. 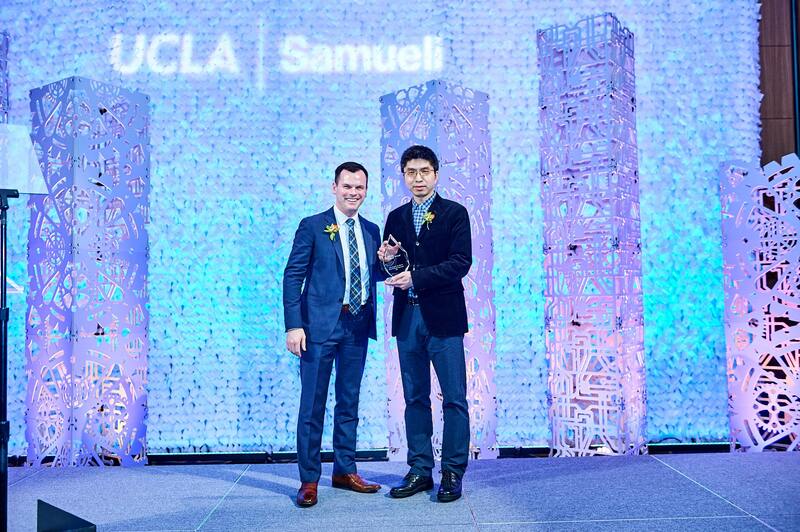 Lei He and Chang Wu received the 1999-2000 UCLA Computer Science Department Outstanding Ph.D. Award for their outstanding achievements during their Ph.D. study at UCLA. Dr. He is now a faculty member at Univ. of Wisconsin at Madison. Dr. Wu is now with Aplus Design Technologies, Inc. Dr. Yeanyow Hwang, a graduate from this group, was the winner of this award last year (1998-99). May. 29, 2000. 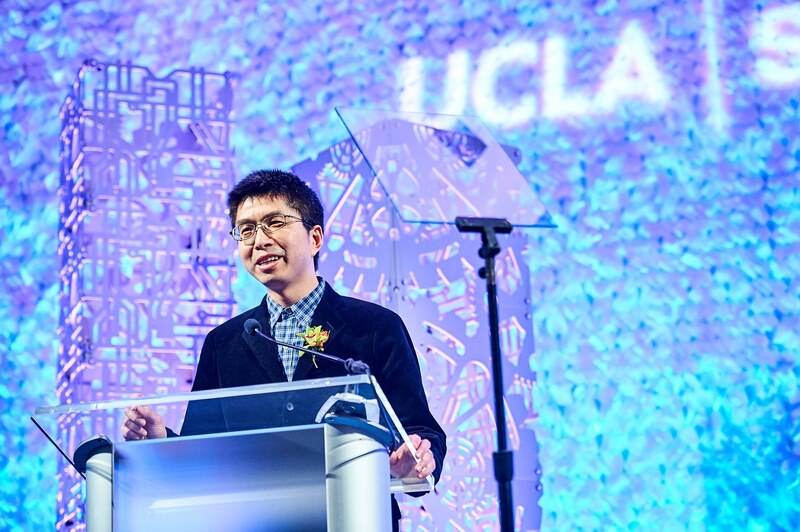 David Pan received the 2000 Dimitris Chorafas Foundation Award which is given each year to two graduate students in the UCLA School of Engineering and Applied Sciences for their outstanding research and academic performance. The award consists of a certificate and a cash prize of $4,000. David is the fourth person in Prof. Cong's group who has received this award since its establishment in 1995. The three previous winners from this group were Cheng-Kok Koh (1996), Lei He (1997) and Songjie Xu (1999). Oct. 22, 1999. Songjie Xu received the 1999 Dimitris Chorafas Foundation Award for her novel research work on technology mapping for field-programmable gate-arrays with embedded memory blocks. The Dimitris Chorafas Foundation Award is given each year to two graduate students in the UCLA School of Engineering and Applied Sciences for their outstanding research and academic performance. The award consists of a certificate and a cash prize of $2,000. Songjie is the third person in Prof. Cong's group who have received this award since its establishment in 1995. The two previous recipients were Cheng-Kok Koh (1996) and Lei He (1997). Lei He received his Ph.D. degree in Sept. 1999 under the supervision of Prof. Jason Cong. Lei came to UCLA VLSI CAD Laboratory in Fall 1994. His thesis is on "Modeling and Optimization of VLSI Interconnects". He joined the Faculty of ECE Department of University of Wisconsin at Madison. Michael enrolled in the Ph.D. program at UCLA Computer Science Department this fall and joined Prof. Jason Cong's group as a graduate student researcher. Michael received his BS degree in the Computer Science Department of Tsinghua University in the summer of 1999. Dr. Taku Uchino joined Prof. Jason Cong's group at UCLA as visiting researcher from Toshiba Corporation. He will be with UCLA for a year and a half. Dr. Uchino received his Ph.D. degree in physics in 1993. His current research interest is power estimation in DSM technology. Dr. Wangning Long joined Prof. Jason Cong's group as a post-doctoral researcher. He received his Ph.D. from Tsinghua University in Beijing, China, in July 1997. His Ph.D. thesis was on "Research on digital system testing and BDD variable ordering". He worked as a post-doctoral researcher from Sept 1997 to July 1999. His current research interest is in designing algorithms for logic synthesis and physical design automation. Chang Wu received his Ph.D. degree in Aug. 1999 under the supervision of Prof. Jason Cong. Chang came to UCLA VLSI CAD Laboratory in Winter 1995, first as a visiting scholar, later became a Ph.D. students. His thesis is on "Performance-Driven FPGA Synthesis for Sequential Circuits". He is now with Aplus Design Technologies as a Senior Engineer. An International workshop on "Challenges and Opportunities In Giga-Scale Integration for System-On-A-Chip", under the joint sponsorship of US National Science Foundation and Taiwan National Research Council, was held in Hsin-Chu, Taiwan during Aug. 25 & 26, 1999. 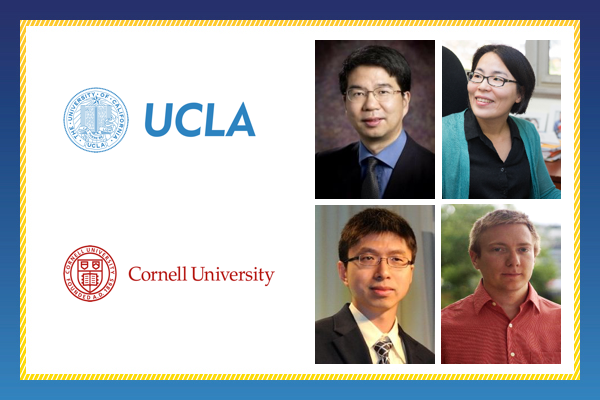 The workshop co-organizers are Professor Jason Cong from University of California, Los Angeles (UCLA) and Professor Youn-Long Lin and Prof. C. L. Liu from Tsinghua University, Taiwan. The workshop were attended by a group of researchers, practitioners, and visionaries from universities, major silicon foundries, EDA companies, large system design houses and fabless semiconductor companies (include FPGA companies), and small IP providers. 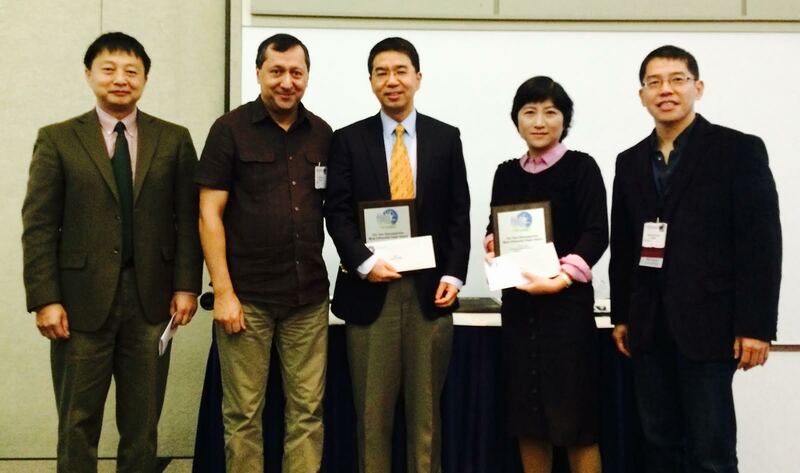 Dr. Chi-Foon Chan, President of Synopsys, delivered the keynote speech at the workshop. For workshop summary and report, please check with the workshop webpage. California MICRO Program awarded the research project at UCLA VLSI CAD Laboratory on "Interconnect Planning and Optimization" for 1999-2000. This project is co-sponsored by Fujitsu Laboratories of America. This project will be directed by Prof. Jason Cong. Aug. 1999: California MICRO Program continued its support to the research project at UCLA VLSI CAD Laboratory on "SRAM-Based FPGA Synthesis and Architecture Evaluation" for 1999-2000. This project is co-sponsored by all major PLD/FPGA vendors, including Actel, Altera, Lucent Technologies, Quickturn, Vantis, and Xilinx. This project will be directed by Prof. Jason Cong. July, 1999: UCLA VLSI CAD Laboratory received another award from Semiconductor Research Corporation for the project on "Nonlinear Programming for Large-Scale Circuit Placement with Complex Constraints". It is a three-year project starting July 1999. The principal investigator of the project is Prof. Jason Cong, and the co-investigators are Prof. Tony Chan (UCLA Math Department) and Prof. Joe Shinnerl (UCLA Computer Science Department). Tianming Kong is the graduate student researcher working on the project. Yeanyow Hwang received 1999 UCLA Computer Science Department Outstanding Ph.D. Award. Jason Cong's research group was awarded another contract from Semiconductor Research Corporation (SRC) on "Nonlinear Programming for Large-Scale Circuit Placement with Complex Constraints". David Z. Pan was awarded the prestigious IBM Research Fellowship for the 1999/2000 academic year. Only about 25 Ph.D. students in US and Canada are awarded, in all areas of interest to IBM, including electrical engineering, computer science, mathematics, physics, and related disciplines. With over 350 exceptional candidates this year, it is indeed a special honor to obtain an IBM Research Award. Congratulations to David! Dr. Hwang has successfully completed his Ph.D. study at UCLA in March 1999. Currently Yeanyow joined Synopsys Design Compiler team. Microsoft Corp. donated its software to VLSI CAD Lab at UCLA for the PC platforms. The donation package include: one Windows NT 4.0 Server, two Windows NT 4.0 Workstation with Office 97 Pro and Visual Studio 6.0. The total value of the package is $4,943.00. The donation is to encourage Universities doing research and developement on Windows NT plateform. Cheng-kok Koh and Patrick Madden both got their Ph.D. degree in June 1998. Now Dr. Koh is a professor in Purdue University, IN and Dr. Madden is a professor in State University of New York, Binghamton, NY. November, 1998 : New Machines from Intel Corp.
Dongmin Xu goes to Cadence Design System Inc. in November, 1998. 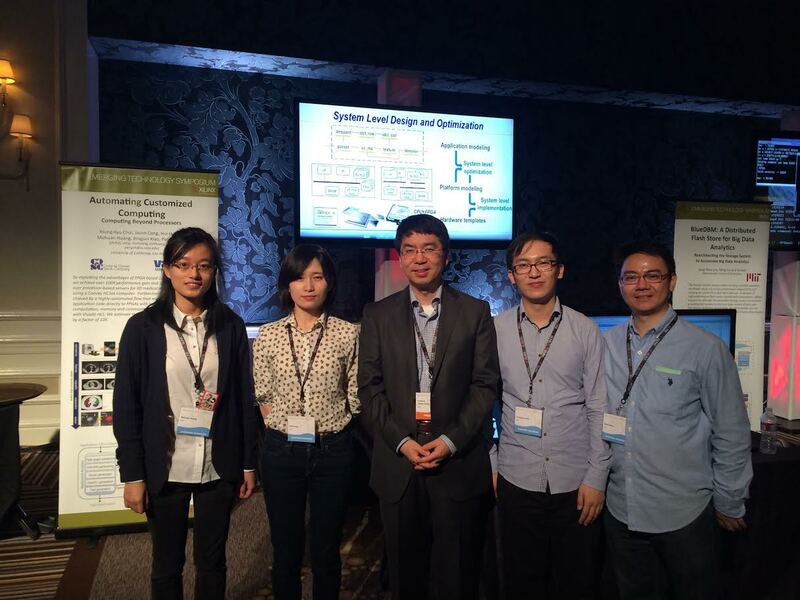 From Apr 29th to May 1st, Zhenyuan Ruan, Weikang Qiao, Jie Wang, Tianhe Yu, Prof. Cong from VAST lab and Dr. Zhenman Fang (postdoc alumni from VAST lab) attended 2018 International Symposium on Field-Programmable Custom Computing Machines (FCCM), a top-tier conference on reconfigurable computing. In FCCM this year, we got two full paper (22/106, acceptance ratio: 20.7%), two short paper (7/48, acceptance ratio: 14.6%) and two posters accepted. For more information, please refer to http://vast.cs.ucla.edu/publications.